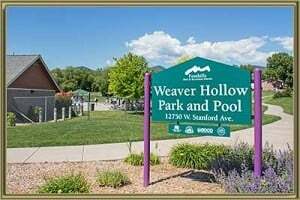 Located just west of C-470 and south of Hwy 285, Friendly Hills is an affordable, family oriented community with tree-lined streets and several parks in the neighborhood. The majority of the homes for sale in Friendly Hills were built in the 1970’s and 1980’s. You will find many different home types including bi-level, tri-level, and 2-story homes ranging from 1300-2500 square feet with 1-2 car attached garages. The mature landscaping sits on lot sizes of 5,000-10,000 square feet. Homes in Friendly Hills subdivision are ideally located near several major attractions such as Bandimere Speedway, Red Rocks Amphitheater, and historic downtown Morrison which offers a wide variety of restaurants and shopping. For the avid golfer, you can enjoy Red Rocks Country Clubor Fox Hollow Golf Course and much many with a short drive. See what your home is worth With an Instant Home Valuation Online. Want advice on selling your house? We provide a free staging consultation, pre-listing prep plan, and a Friendy Hills real estate market analysis. Call us at 303-325-5690 to learn more. New to the Area? Call our Friendy Hills real estate agent at 303-325-5690 to schedule your tour of Homes in Morrison CO.